We are looking for NOVEL SOLUTIONS, we are CREATIVE and capture NEW TECHNOLOGIES. Our success is based on openness, trust, team spirit and desire to actively develop and improve. Since the year 1993, when our company was established in the Czech Republic we have become the world leader in development and manufacture of equipment for physical medicine and a renowned company in the field of cardiology and aesthetic medicine with an ever growing market share. We use cutting edge technologies in development and production of devices for physical medicine, cardiology and non-invasive aesthetic medicine. The philosophy of the company is to market unique, high added value and top quality products with an impressive design. The aesthetic medicine division offers breakthrough technologies for reducing fat and cellulite, lifting skin and removing wrinkles. 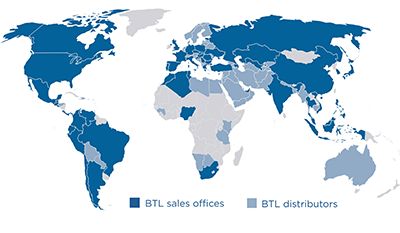 BTL's innovative approach and entrepreneurial spirit span over 20 years.